Posh striker Conor Washington charges down an attempted clearance kick from Ipswich goalkeeper Dean Gerken. Photo: Joe Dent/theposh.com. 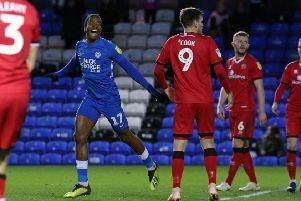 Peterborough United preserved their unbeaten pre-season record after putting in a reslient performance during a goalless draw against Championship side Ipswich Town at the ABAX Stadium today (July 25). Posh started the game with a line-up that could well start at Rochdale on the opening day of the League One season (August 8), with all the usual suspects present. Jack Collison and Michael Bostwick bolstered the midfield, while strike partnership Joe Gormley and Conor Washington once again looked to do the damage upfront. Posh man-of-the-match Jack Collison strikes at goal against Ipswich. Photo: Joe Dent/theposh.com. Ipswich also fielded a strong line-up including forward powerhouse Daryl Murphy and tricky David McGoldrick. The first sight of Goal for Posh fell to striker Gormley who blazed a volley over from the edge of the penalty area on 10 minutes. At the other end, McGoldrick ghosted past Kgosi Nthle on the right flank before firing just wide of Posh ‘keeper Ben Alnwick’s far post with 15 minutes on the clock. Posh skipper Bostwick then fired an effort past the post on 22 minutes following good link-up play from Washington and Jon Taylor but both keepers remained untested the opening quarter of the match. With 30 minutes on the clock the game livened up, Ipswich keeper Dean Gerken had a nervy moment when Washington closed down a clearance kick that cannoned off the Posh forward and over the bar. Posh had a flurry of chances minutes later, first Gerken had to be on his guard to tip a long range Collison effort over the crossbar before parrying a strong Taylor effort from close range shortly afterwards. On 39 minutes Posh defender Gaby Zakuani put in a superb last-ditch challenge on the rampaging Jonathan Parr inside the area to deny the former Crystal Palace man a clear shot at goal. After the break Ipswich piled on the pressure, but the blue back-line stood firm, seeing off a procession of dangerous balls into the home penalty area in the process. Sponsors’ man-of-the match Collison was withdrawn from the action with another 57 minutes under his belt. He looked classy and composed throughout. A few minutes later Marcus Maddison’s barn-storming run down the right was illegally halted by Parr before the Posh winger fired the resulting free-kick over the bar. Ipswich then made 10 changes on the hour mark, but continued to look the most threatening, Adam McDonnell came within a whisker of breaking the deadlock in the 69th minute when his crafted effort struck the post. Posh fashioned a chance on 75 minutes when Joe Newell found Gormley at the far post, but his sweetly struck shot was well blocked by an orange shirt. In the dying embers of the game Josh Yowerth headed a Alex Henshall corner wide of the mark from a good position. The game ended goal-less, but with plenty of positives to take from a defensively solid performance from Dave Robertson’s men against strong opposition. Posh are next in action at Grimsby on Tuesday (July 28). Posh: Alnwick, Smith, Zakuani, Santos (sub 50 minutes Brisley), Ntlhe, Maddison (sub 73 minutes: H.Anderson), Collison (sub 57 minutes: J.Anderson) Bostwick, Taylor (sub 73 minutes: Newell), Washington, shington, Gormley. Unused substitutes: Henry, Fox, Vassell, Angol, Adebayo-Rowling, Sadlier, Coulibaly, Oztumer. Ipswich Gerken, Chambers, Parr, Maitland-Niles, Smith, Berra, Coke, Bishop, Murphy, McGoldrick, Fraser. Substitutes: Bialkowski, Bru, Tabb, Yoweth, Emmanuel, Kenlock, Ambrose, Skuse, Henshall, Stewart, Connolly, McDonnell, Bewyu.